‘Dr. Munshi-South has joined the ranks of a small but growing number of field biologists who study urban evolution — not the rise and fall of skyscrapers and neighborhoods, but the biological changes that cities bring to the wildlife that inhabits them. For these scientists, the New York metropolitan region is one great laboratory. The mice are the object of Dr. Munshi-South’s attention. Since 2008, he and his colleagues have fanned out across the city to study how the rise of New York influenced the evolution of the deer mice. On this day in Highbridge Park his students, Mr. Cocco and Mr. Harris, spread a blue tarp on the forest floor, while Dr. Munshi-South walked to an orange flag planted in the ground. He picked up an aluminum box sitting next to the flag and pushed in a door at one end. At the other end of the box crouched a white-footed mouse. It gazed back at Dr. Munshi-South with bulging black eyes. The researchers inspected 50 traps laid the day before and found seven mice inside. 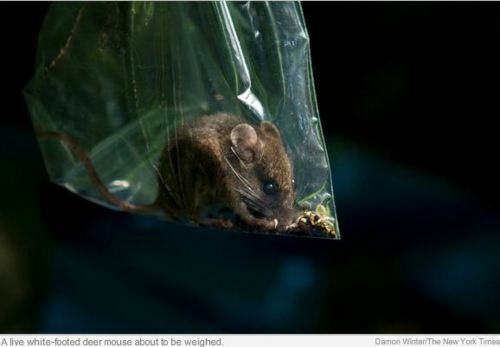 They plopped each mouse out of its trap and into a Ziploc bag. They clipped a scale to each bag to weigh the mice. Dr. Munshi-South gently took hold of the animals so his students could measure them with a ruler along their backs. White-footed mice live today in forests from Canada to Mexico. They arrived in the New York City region after ice age glaciers retreated 12,000 years ago. In the past few centuries, as their forest home became a city, they survived in New York’s patches of woods. (House mice, which New Yorkers battle in their apartments, arrived with European settlers.) Research by Dr. Munshi-South and his colleagues suggests that New York’s white-footed mice, which occupy isolated patches, are adapting to life in the city. . . .
On a recent afternoon, James Danoff-Burg and Rob Dunn were clambering around in a narrow Broadway median on the Upper West Side. Dr. Danoff-Burg, a biologist at Columbia University, was digging up plastic cups from the ivy. Dr. Dunn, a biologist from North Carolina State University, was five feet in the air, crouched on a bough of a Japanese maple. “New one! New one!” Dr. Dunn shouted over the traffic. He and Dr. Danoff-Burg were surveying the median for species of ants. Dr. Dunn had spotted Crematogaster lineolata, an ant species that he and Dr. Danoff-Burg had never found before in this particular urban habitat. Dr. Danoff-Burg, Dr. Dunn and their colleagues chose to study the medians of Broadway to see how human activity alters biodiversity. In this artificial city, there is no environment more artificial than these medians, which sit on fill that was poured on top of subway tunnels. The scientists have found a blend of ant species, some that have been here since before the city existed, and others that have arrived more recently, hitching rides on ships, planes and trucks. The most common ant Dr. Danoff-Burg and Dr. Dunn encounter is the pavement ant (Tetramorium caespitum), which came from somewhere in Europe. Biologists find a mixture of native and non-native in all the life forms they study in New York, from the trees in Central Park to the birds of Jamaica Bay. The biodiversity of New York today is the result of extinctions, invasions and adaptations. Manhattan was once home to 21 native species of orchids; today they’re all gone. In the current issue of Global Ecology and Biogeography, a team of scientists surveyedplant biodiversity in New York and 10 other cities. They found that 401 native plant species have vanished from New York since 1624, while 1,159 remain. New York’s native flora is vulnerable to extinction today in part because it was well adapted to the closed forests that once stood where the city is now. As native species became extinct, new ones came to the city. As a major point of entry to the United States, New York is where many of North America’s invasive species first arrived. Some introductions were intentional. Starlings were brought to Central Park in 1890, for instance, as part of a project to bring every bird mentioned in Shakespeare to the United States. But most introduced species slipped in quietly. Many non-native species quickly died out, but some fit comfortably into the city’s wildlife, and others wreaked havoc — first in New York and then beyond. New York was the port of entry for Dutch elm disease, chestnut blight, Asian longhorned beetles and other threats to trees across the country. As the invaders adapted to New York, they put extra pressure on native species, competing with them for space and food. Recent research by the Brooklyn Botanic Garden found that American bittersweet vines are dwindling away within a 50-mile radius of New York City, outcompeted by Oriental bittersweet. At the same time, the two species are interbreeding, producing hybrids. “It’s a double-whammy,” said James D. Lewis, a plant ecologist at Fordham University. Yet many native species still hold on. Dr. Danoff-Burg and Dr. Dunn were surprised to find that 9 out of the 13 ant species living in Broadway’s medians are native. Once the medians were built, the native species rushed in along with the invaders and created an ecosystem. Dr. Danoff-Burg and Dr. Dunn are trying to figure out what controls the balance of native and new species in New York. They don’t understand why some medians have more biodiversity than others, for example. On natural islands, biodiversity tends to increase with the size of the islands. Dr. Danoff-Burg and Dr. Dunn find no such correlation in the medians on Broadway. They also have to determine how native species of ants are coexisting in such close quarters with invasive species. via New York – Empire of Evolution – NYTimes.com. This entry was posted in plants, urban ecology, wildlife and tagged golden gate park, invasive plants, urban ecology, urban evolution, urban parks. Bookmark the permalink. So interesting! I love that there is a whole ecosystem on the traffic median! San Francisco is one of the 11 cities studied in the cited article (“Duncan et al, “Plant traits and extinction in urban areas: a meta-analysis of 11 cities,” Global Ecology and Biogeography, July 2011). Happily, the study reports that Ninety-seven percent of the 714 plant species known to exist in San Francisco in 1850 are still found in San Francisco. This article is fascinating. And one of its most intriguing aspects is that urban biologists can find unique research material by walking to a local park. Another example of an opportunity so close and accessible that it is overlooked until the right inquiring minds find it.